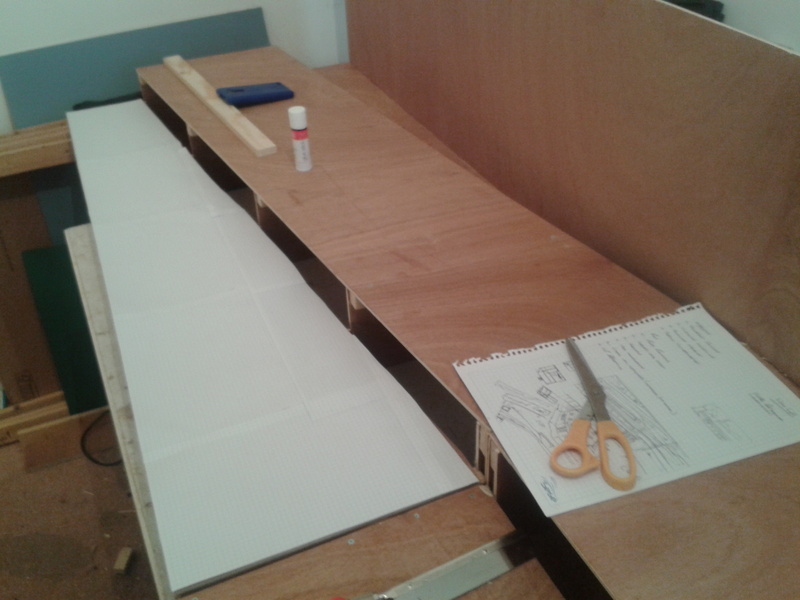 My baseboards are about 41" or just over 1000mm high. Somewhere in the 900 - 1000 mm seems to work best. 1000mm for me, too. 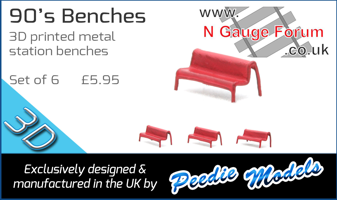 Another advantage is that the layout can be seen at about eye-level when sitting, depending on your height, of course. I think I may have to make it even higher, but will it make it difficult for potential exhibition viewers? 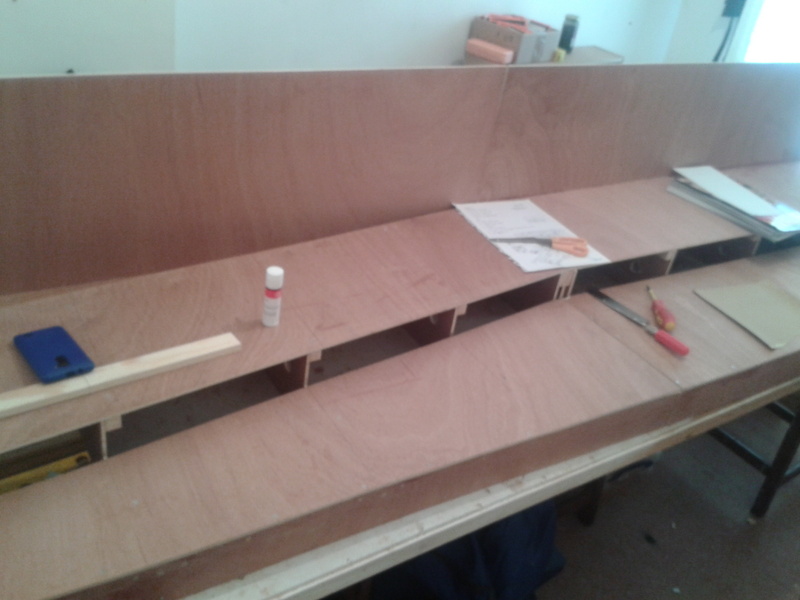 Well despite being knocked for six health wise lately I have managed to do a little bit more on the layout boards and I now have two pretty much completed. 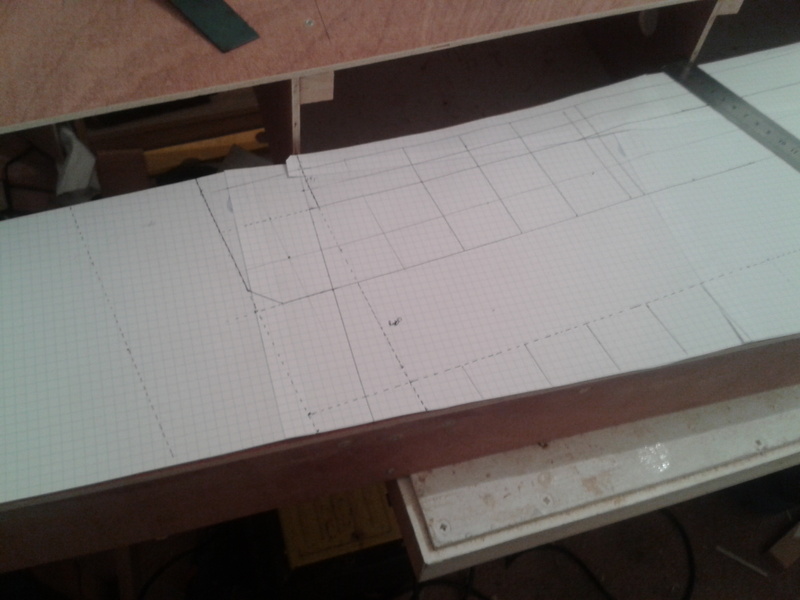 Anyway with the beards at this stage I can start to transfer the plan onto them, and to do this I tend to cut some graph paper to cover the area I'm looking at and then transfer my plan on to this. I cant be the only person to do this so if I'm going over old ground, I'm sorry. What I do then is to transfer the details from my I initial plans onto this graph paper "life sized" I find this helps me to actually visualise how the area will feel before I start either producing mock up buildings or even the finished ones. I will need a lot of buildings for this layout, and lots of terraces, which is a good thing? I mean all that dirt and grot. So the fun begins, all I have to decide now is if I should revert back to plasti-card construction, ir continue using card??? Is it time to do some modelling? Part of my idea for Lugsdale Road was to produce a little terminus station at the end of an LMS branch. 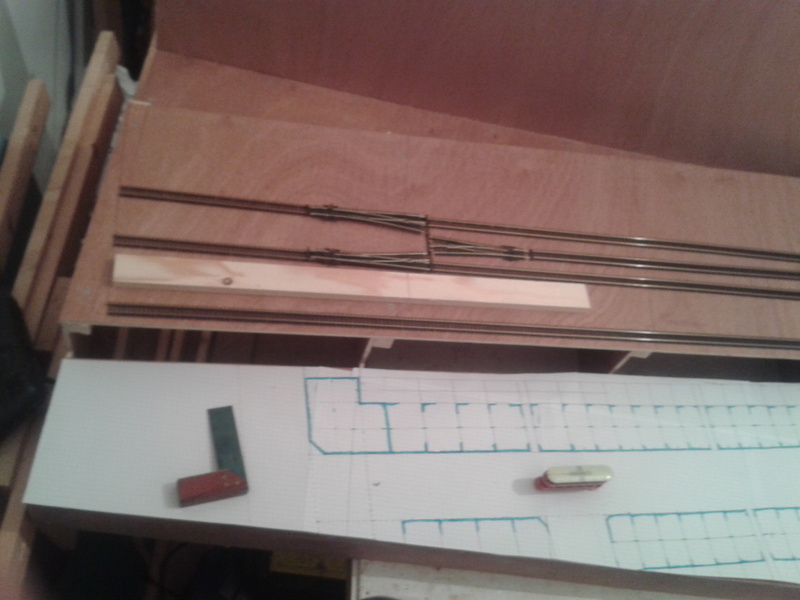 OH no not another branch line layout I can hear you all shouting, but this definitely wont be like those GWR things . 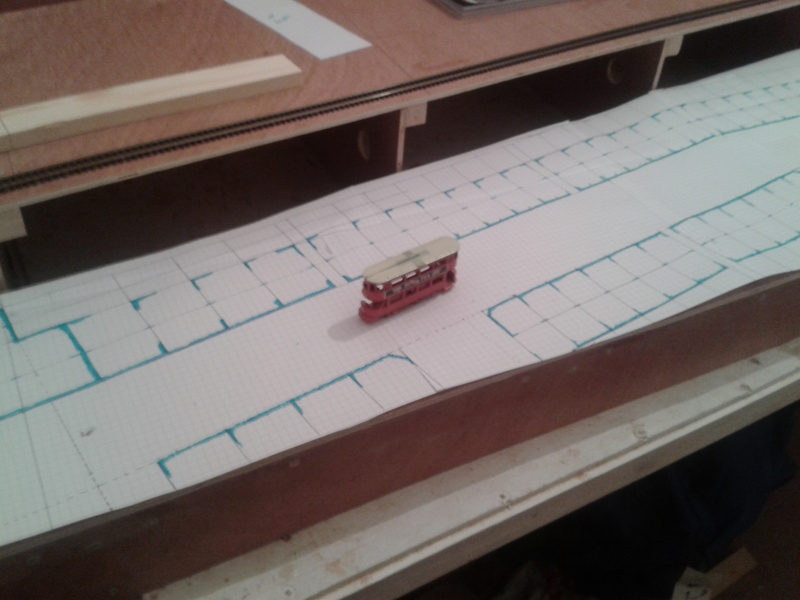 Layout building is not a quick process but I am at the stage where I am working out the final format for the street that will run at least partially along the front of the layout.the centre of a typical industrial town in the northwest. Which means I have an excuse to build terrace after terrace after terrace. I think the majority of the plan for the street is nearly finalised as the Domestic Overlord allowed me my felt tip pens so I could do some colouring. It also meant I could investigate running a Tram line along the street too, just for the sake of authenticity, I mean the layout will be set in the 30s-40s. I hope this plan for the street will invoke the urban look I'm striving for, but any suggestions would be appreciated, the station will sit above this street, and will have a basic goods yard attached, so I can indulge in some shunting. I'm not going to publish the full track plan yet, but you can get a glimpse of what I'm thinking from the attached picture, but like most things the plan may change? What do you think so far? Interesting PP and certainly sounds evocative of the planned era. A challenge may be to prevent the very long rows of terraced house from looking nicely done but boring to the (exhibition) visiting viewer. Plenty of action on the tracks is probably your plan so you can ignore the incorrect challenge mentioned! Look forward to seeing how the plan comes to life. My level of interest elevates even more! Stone? Concrete? Quicksand? Please don't keep us in suspenders.